A Christian minister who was forced off of the Temple Mount by Muslim officials has released a video of support for Jewish rights on the Temple Mount, urging Jews and “the children of Abraham” throughout the world to stand together to end Islamist harassment and discriminatory measures on Judaism’s holiest site. 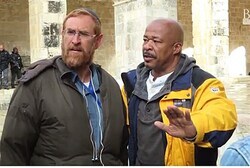 Pastor Keith Johnson told how he recently visited the holy site in Jerusalem when he bumped into veteran Temple Mount activist Yehuda Glick. But his warm greeting for one of the leaders of the struggle for Jewish prayer rights on the Mount attracted the attention of the Waqf – the Islamic trust which administers the site and has been behind the pressure to continue a ban on non-Muslim worship there. Angry Waqf officials surrounded the pastor and forced his group off of the Temple Mount – but he defiantly went back to the entrance and ascended once more. The irony is that Jews who are forced off the Mount by the Waqf are usually banned from reentering. “As an American pastor I am appalled by the actions of some Muslims who chastise Jewish visitors – including children – who desire to ascend the Temple Mount,” he declared. Despite its supreme importance to Jews as the site of the two Holy Temples of Jerusalem, non-Muslim visitors are banned from praying there and face arrest if suspected of doing so. Visibly Jewish visitors are subjected to particularly rigorous checks for “forbidden religious items”, which many describe as discriminatory and humiliating, and religious groups are closely monitored both by Waqf officials and Israeli police. Jewish groups often face blanket bans from ascending altogether, and Islamist groups regularly riot or engage in organized campaigns of harassment of Jewish visitors, in order to prevent Jews from ascending. 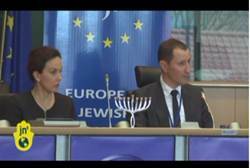 The recent Jewish festival of Pesach (Passover) saw particularly severe riots by Hamas-affiliated groups on the Temple Mount – triggering calls for the resignation of Israel’s Internal Security Minister and prompting Tuesday’s conference. Posted in Israel, Terrorism and tagged Freedom, Islam, Israel, Jihad, Palestinians, Terrorism.